As we were led through the last set of curtains into complete darkness, my heart plunged. “What have I dragged myself into, Jaini?” I thought, scared of what was to come next. 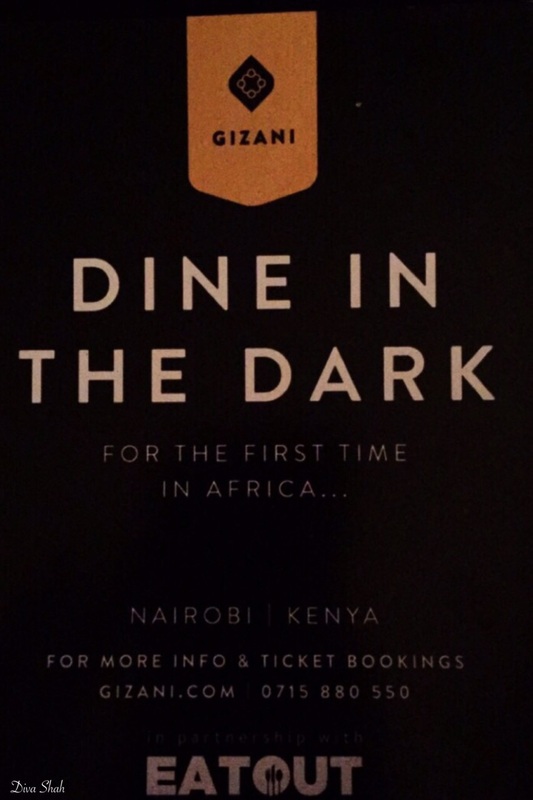 After seeing several events on my Facebook newsfeed and a couple of blog posts on Eat Out Kenya’s Yummy blog, I was tremendously intrigued by Gizani’s Dining In The Dark events across a few restaurants in Nairobi. And so, after several emails and phone calls, I, along with my sister and cousins, finally got to experience this wonderful experience and it was far more than I had ever expected it to be. Gizani means “In the dark” in Swahili. Abdul Kamara, who has been visually impaired since 2008, founded the fascinating concept, inspired by the well-known enterprise “Dans le Noir” in Paris. This is the first time Dining In The Dark is taking place in Nairobi, and this was my first dining in the dark and I was a myriad of emotions – nervous, anxious, excited, scared and more so, just curious. Once we reached the venue – The Tribe Hotel in Nairobi, we were led towards the dining room. Whilst on our way to the dining room, we realized that dining room was not wheelchair accessible and so I had to be carried down the stairs. I was disappointed because I had requested wheelchair access when I had booked the dinner. Once we reached the reception area for the Gizani event, Yaniv, who was receiving the guests, profusely apologized for the miscommunication that led to the lack of wheelchair access. Thereafter, we had to give up our phones and any other light-emitting devices to avoid any light in the dark dining room. They even taped off my wheelchair controls light! Then we were introduced to the highly qualified, visually impaired servers, Morris and Laura, who would lead us to our table in the dining room. Usually diners are seated at random to allow people to interact with strangers in the dark to maximize the dining experience but I had requested that our entire group sit together. My sister was initially seated separately, so she was led in first. My cousin turned on the manual mode for my wheelchair as I stowed away the controls to allow easy access to the dining table in the dark. Then Morris held my hand and my cousin pushed me along, as everyone formed a single file behind me with Laura ushering at the back. Once we got through the three sets of the velvet curtains, we were in complete, pitch darkness. At that point, I thought to myself, “What have I dragged myself into?” and I started feeling tense. As Morris led us to our table, my cousin and Laura helped position the wheelchair at the head of the table (always my favorite spot!). My elder cousin felt claustrophobic in the dark, because we were in complete, and I mean complete, darkness so he left. And so my sister rejoined us. Once we were all seated, Morris and Laura explained how the cutlery and the plates were arranged. I suddenly felt extremely aware of where my hands were and had to consciously monitor my movement to avoid knocking something over. They, then, brought us bedrolls. Laura came and gave a pitcher of water to my aunt. Everyone had to pour themselves a glass of water. By now I had grown accustomed to the darkness and was already feeling familiar to my surroundings. We were asked to speak in hushed tones as sound is amplified in the dark. All my other senses were heightened and it was a completely new, yet somewhat familiar, feeling! Then, the starters came out. I felt a round plate placed in front of me, as Laura informed me. I wasn’t sure what was inside, so out of instinct, I stuck my finger in. It turned out to be cold and wet appetizer. I put a spoonful into my mouth. My taste buds were hit by a creamy and slightly tangy yogurt-like consistency. Shouts of “cream cheese”, “yogurt” and others hit the table, as we tried to decipher what we were eating. In my next spoonful, a tangy balsamic sauce and the crunch of lettuce engulfed my palate, and I could smell basil. But after several bites, I could no longer eat this decadent rich starter – it was too heavy for me. Then, Laura brought out the main course. Unfortunately, they weren’t enough plates for all of us, so I had to wait till they got me a plate. As she served me, she reminded me that the plate was hot. I tried to pick up what felt like a savory pastry. As I could not cut it with my fork, Laura took it back to the kitchen to get chopped into small pieces for me. At this point, Eric Wainaina, a popular Kenyan singer-songwriter, serenaded us alongside the visually impaired wait staff. Oh! I cannot even begin to describe how beautiful they sounded. Each note was incredibly intensified in the dark as our sense of hearing was deeply enhanced. When Laura brought my mains back, I sunk my teeth into what seemed to be a vegetable pie, filled with potato, carrot and cheese, served with some sauce or salsa. Unfortunately, I didn’t really enjoy this dish. I found it to be lackluster and was hoping for something more exciting. At that point, a drunken man who had sneaked in his phone started flapping it around; disturbing us, as we all had grown comfortable with the darkness. Thankfully it was just a few seconds. By the time I was done with the main dish, the entire dining room was empty, and we were the only ones there. During the mains, Winnie was going around the table massaging everyone. Laura brought out the dessert. I dug in and tasted whipped cream with a hint of passion and chocolate. My sister exclaimed that she got a raspberry. As I tried to cut through the dessert, I realized that it had a hard pie-like crust. Again, Laura returned it to the kitchen and brought it back chopped up. As I tried to eat the dessert, it kept falling off the spoon. Giving up and realizing that no one could see (and judge) me, I just picked up a piece and stuffed it in my mouth. The pleasant taste of chocolate hit my taste buds as I bit into the crunchy shell. The dessert seemed to be some sort of chocolate pie or tart. Then I bit into a juicy raspberry, my favorite berry. While I ate, Winnie gave me a neck and upper back massage. At first, the sensation seemed odd but it was by far so realizing that now I wish I could get a massage every time I eat out. After finishing up with my dessert, last as usual (I’m an extremely slow eater – I like to savor my food), Laura led us out with Morris at the back. What truly amazed me was that Laura was guiding the wheelchair while walking backwards through a maze of tables and not once did she or my wheelchair crash into anything. Furthermore, none of the blind servers tripped on the wheelchair’s back wheels, which had been a main concern for me before I booked for this experience. As we walked through the tunnel of curtains and out of the dining room, the Gizani team applauded us as our eyes gradually accustomed to the lights. Then, the director of Gizani introduced to the entire team of the visually impaired wait staff and the chefs revealed what they had made for us. To preserve the mystery of the experience, I will not reveal what we ate. Now my tired phrase comes in at this point. Okay, maybe you find it cliché, but hey! Here goes…Gizani’s Dining In The Dark event was a priceless night! The entire endeavor may seem pricy at Ksh 5000/- per person (prices may vary per location) but it is worth the value. This is the first time the visually impaired staff have held a proper job in Nairobi where they have the chance to lead, and not be guided, through this wonderful model set up by Gizani. For more information on Gizani, click here and to book for the events through Eat Out Kenya, click here. Comment below on whether you enjoyed my first ever food review and if you would like to see more. Like this post if you like donuts (and maybe send some my way too ;)). Next The Time I went to Canada for Six Hours | Victoria, B.C. Yesss! I’m so happy you got to experience Dining in the Dark! I love that you stuck your fingers in your food (much like I did) when eating. It’s comforting knowing you can’t be observed and you can kinda act a fool surrounded by complete strangers. Also sounded like a special night with Eric Wainaina there. Thank you! Your post about it really got me super-excited about it. Thank you again 🙂 It was a special night, indeed. It was indeed a real life experience in the dark. We thoroughly enjoyed it. It really was incredible. And thank you 🙂 it was quite difficult putting down the descriptions without accompanying photos, but I think I managed okay. Thank you! 🙂 I have a little list of restaurants to visit in London now, thanks to you! Hey Jaini! Your blog is really interesting! Love it 🙂 and this dining experience sounds like so much fun! I would love to try it and review it sometime. Keep blogging, don’t stop! Hi Yashvi 🙂 thank you for your kind words. It is an amazing experience 🙂 you’d love it, I’m sure. And lastly, thank you for your encouragement – keep on reading!